Mariah’s touch rots any organic material she comes into contact with, burning flesh on contact, quickly turning regular humans into withered husks. The touch used to take longer to affect ’dead‘ organics, such as taking an hour to erode a wooden chair she was tied down to, but this no longer seems to be a problem. Her ’touch‘ is not controllable, so she has to constantly wear long gloves, and be careful not to allow others to touch her exposed skin. A skilled witch, Mariah has a fair knowledge of the occult, and has erected mystical traps in the past. She allegedly has the ability to erect a ward, a solid invisible field. This is presumably the same as her brother is capable of, and so requires her complete concentration to maintain. She is able to disperse her brother’s ward by touch, even when unconscious, so presumably he can do the same to hers. Mariah is also a highly skilled information gatherer, with connections worldwide, and is able to assemble a large amount of data on a subject in a relatively short time. As a child, Mariah was always arguing with her brother, Oscar, a habit that caused an accident during a family trip, when the argument distracted her father while he was driving, sending the car off the road and killing their parents. 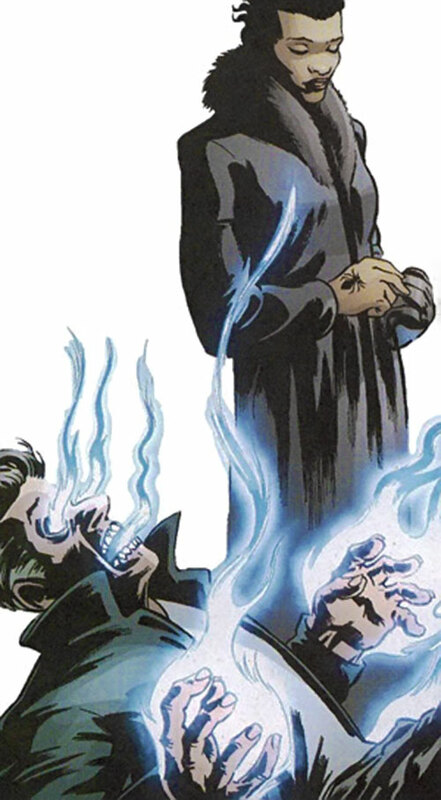 Mariah maintained her enmity with her brother, and they both developed similar abilities, and occult interests, and Oscar, now calling himself Wilde, captured Mariah’s death, gaining power over her. 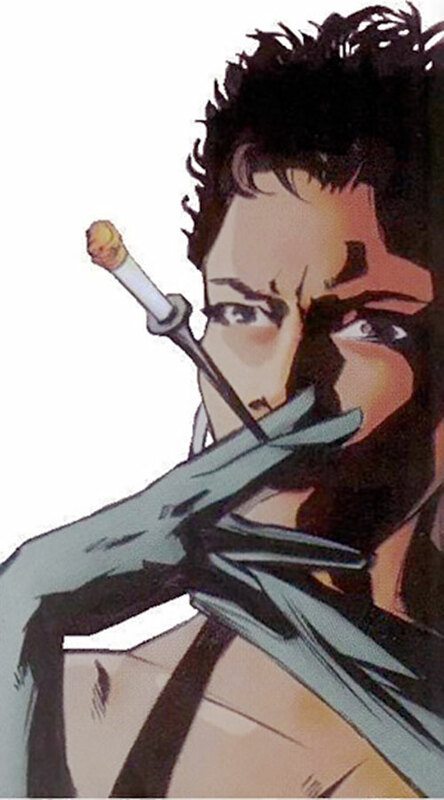 Mariah became the information broker for the city of Bête Noire, one of three cities which shape the world, and became one of the main aides to its Magistrate, Doctor Juris. She also met the city’s Chief Enforcer, Shadow Boxer, who proved to be immune to her touch, and began a relationship with him. She developed an animosity with Dolf, the owner of the Furors bar, mainly due to his racism. When the Fallen Angel came to Bête Noire, Mariah came into conflict with her fairly quickly, as the Angel been hired to rescue some Romani children that Mariah was selling into prostitution. The encounter left Mariah under a curse which forced her to flee Bête Noire. Eventually removing the curse and returning to Bête Noire, Mariah appeared to the Angel at her day job, as physical education teacher at a school. Drawing her into a wooded area, Mariah kept herself hidden as she offered the Angel “The Shard”, a relic she’d been seeking for a previous client, which Mariah had previously stolen, in exchange for help, eliciting an agreement to meet later. The Fallen Angel didn’t wait, appearing at Mariah’s place, from where she abducted her. After being tortured, Mariah told Angel the location of the Shard, although she neglected to mention that she’d trapped the place in preparation for the Angel double-crossing her. Escaping from captivity, Mariah was found by Boxer, who’d been searching for her, and taken to Bumper’s for attention. It was there that Wilde found her, demanding that she turn over the Shard which she was to deliver to him. The Fallen Angel soon arrived, mainly due to curiosity, and decided to help Mariah, managing to release her death and freeing her from Wilde’s control. Wilde left. When Boxer went missing, Mariah was suspicious of Juris’ assurances that he was on a mission, and when Juris finally took her to Boxer’s grave, she knew he was lying when he said that the Fallen Angel had killed him. Vowing to get revenge on Juris, Mariah formed a secret alliance with the Angel. It was a couple of decades before she got to see Juris die, as he handed his curse down to his son, Jude, and tried to leave Bête Noire. Upon passing the city limits, the aging which the city had saved him from all rushed in at once, and Mariah and Fallen Angel watched him rapidly age into a withered husk. By this time, Mariah had begun a relationship with Malachi, a former friend of the Fallen Angel, who was also immune to her touch. 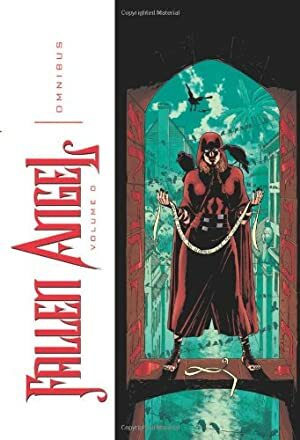 He was now an operative of the Hierarchy, who really ran the city, which brought him into conflict with the Fallen Angel, so the uneasy alliance between Mariah and the Angel became even shakier. When the Hierarchy staged a coup against the new Magistrate, Mariah was the first casualty, stabbed by Wilde, who was now working for the Hierarchy. Badly wounded, she was left unconscious in Furors, under Dolf’s care. Unfortunately Dolf saw her as a threat to his beloved Fallen Angel, and tried to smother her. He was stopped by Slate, the city’s Chief Examiner, who was in turn killed by Dolf’s employee, Ezil. Recovered by Malachi before Dolf could do anything else, the unconscious Mariah was used to disperse her brother’s ward. She came to as the Fallen Angel’s forces were fleeing the disappearing Bête Noire, to find that Malachi had been killed by the new Magistrate, Moloch. Calm and composed, Mariah always tries to keep control, and is always looking for the best way to play a situation. Part of her detached demeanour is likely due to her inability to touch most people without seriously damaging them, meaning that her every move has to be thought through before she acts, and she’s always planning ahead. She rarely lets grudges get in the way of her plans, having established an uneasy alliance with the Fallen Angel, even after she tortured Mariah. It doesn’t mean she’s forgiven her, just that she’s capable of putting the hatred aside to achieve other goals. Mariah is allegedly capable of projecting a powerful Force Field similar to that of her brother, but this hasn’t been demonstrated, so I’ve included it as a Marginal Power. She’s been referred to as a witch, and a couple of her abilities have a mystical source, so I’ve given her some Occultist, although it hasn’t been fully displayed. One of 3 such cities around the world (another being Babel, the City of Fire and Life), Bête Noire is said to shape the world, events taking place in it echoing on a global scale. Seeming to possess some form of sentience, the city decides who may enter and leave it, and prevents those it still finds useful from dying or aging, even speeding their recovery while they sleep. She had high level Connections to Shadow Boxer and Malachi, when they were alive. She also had 20 APs of Invulnerability while her brother held her death. During the period published by DC, Mariah’s Cell Rot had the Limitation that its effect on formerly living matter is slowed by 10 APs of time, but this appears to have been lost over time.